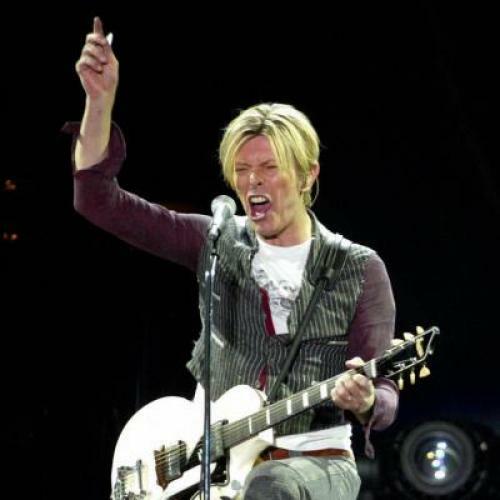 Lyrically, the song is built on imagery that evokes the contrasts between the divided and the reunified Berlin, with implied sympathies for the simmering Cold War city that Bowie used for the three “Berlin period” albums that he made with Brian Eno in the late 1970s: Low, Heroes, and Lodger. In fact, the words of “Where Are We Now” are essentially a Google Street View montage of the old and the new cities, beginning with a reference to Patzdamer Platz, which the Berlin Wall once dissected and is now a monument to post-reunification capitalism. The song goes on to name-check Nurnberger Strasse, where Bowie used to dance in retro-Weimar disco clubs that have since been replaced with condos and luxury shops. The upcoming album, which will be released in March, has an element of retreading, too: the cover of the album uses the iconic pseudo-Fascist Heroes album art, with the original title crossed out and Bowie’s face obscured by the new title, The Next Day. Like a lot of people in their late sixties, Bowie is looking at the day ahead through the lens of memory, a lens that tints and blurs. “Where Are We Now” is a simple, quiet, contemplative song concerned in part with a third kind of reunification, a spiritual sort. Bowie sings repeatedly in the song about “walking the dead,” a phrase also used in some realms of mysticism for the process of preparing to “cross over” into death. Something like that seems to be what Bowie has in mind in the song. (Though it’s possible that he picked up the phrase from the English TV series Walking the Dead, a show about detectives solving cold cases.) If Bowie has indeed been thinking about his own mortality, he is certainly united with his fans. As one of them, I’m glad he’s back to making music. Bowie's art has always been mainly about the plasticity of its artist's image. With his sharp curatorial instincts, he may want now to settle on one image for posterity, and it makes good sense for him to go with the Bowie of Berlin, the past self of his that seems most serious. With “Where Are We Now, ” Bowie makes clear that where he wants to be is a place in his creative past.